Billie Holiday at the d’Orly airport, Paris, photographed by Jean-Pierre Leloir, 1958. It was not quite that simple. There is also the way she follows the beat instead of singing on beat, how she shapes her notes, how her singing is so bare and plain, etc. It also helps that her life was such a mess, full of so much pain and despair. 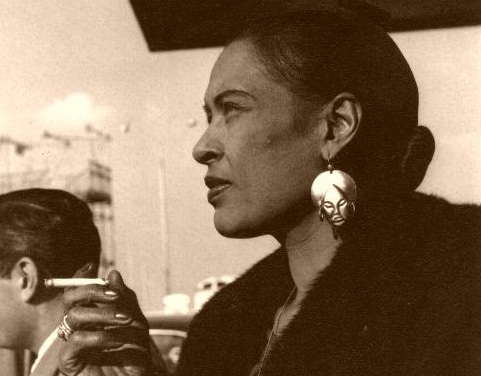 To misquote Gil Scott-Heron, Billie Holiday is a ray of truth in a world of plastic people. She was born in Philadelphia and grew up in Baltimore, the daughter of a jazz musician, Clarence Holiday, who soon disappeared from her life. She was raped at age ten and by age 14, in 1929, she was a prostitute in the world of the Harlem Renaissance. She loved listening to Louis Armstrong and Bessie Smith and sang, for herself and her mother. She tried out as a dancer at a Harlem night club and failed. But then the piano man said she should try out as a singer. Her singing moved people to tears. In 1932 John Hammond of Columbia Records heard her in Harlem and a year later she started recording for Columbia. They gave her the songs the white singers did not want – and she made them into masterpieces. In the late 1930s she went on the road with Count Basie and then with Artie Shaw. With Shaw she became one of the first blacks to sing with an all-white band. Not only that, they went through the Jim Crow South. But the racism was too much. She quit the band and came back to New York. In 1939 she recorded “Strange Fruit”. It was a hit among the interracial, left-wing set at the Cafe Society in Greenwich Village in New York. In 1941 she married Jimmy Monroe. He got her hooked on opium and heroin. Now her life became an endless scene of bad boyfriends who got her drugs, spent her money and beat her up. She was arrested for possession of narcotics in 1947, 1949, 1951, 1956 and 1959. As a convicted felon she could no longer perform at most clubs in New York, though she could still record and did. In 1956 she performed at Carnegie Hall, a great honour for any singer and a rare one for a black singer in those days. Then she started losing her voice. Some say it made her singing even better, but others cannot bear to hear it. In 1959, after years of drugs, her liver, kidney and heart gave out and she died. She was 44. Oh, thank you for this, Abagond. I own the “Essential Billie Holiday”. So beautiful. I’ve only heard a couple of her songs, but, definitely, what a voice! I loved the signature gardenias she wore in her hair…so pretty. I may be the only person, but I never thought her voice or her interpretations were that great. Grew up listening to Jazz so it is not a prejudice to that genre. My favorite singer was Nina Simone. I am a fan. She may not be the best musician, most honed singer, but her voice cuts the air like a knife. When she sings about sorrow, it hits like a ton of bricks, because one gets the sense that this is for real. Not that Nina Simone or others are not great, but I think Billie Holiday has magic in her voice. Not for all tastes but I like her songs. Thanks for this one. Once again a good story! I read a recent biography of Billie Holiday, ‘With Billie’. It was quite interesting to say the least. It is based upon interviews from Holiday’s ‘friends’ family acquaintances from her childhood on through adulthood. The interviewer(Linda Kuehl) ended up jumping to her death before writing the book. The information she gathered was subsequently used as references in other books on Holiday. It was apparently put into some semblance of order, by another writer. I also like Sarah Vaughn, Carmen McRae, and Dinah Washington. She looks absolutely regal in this photo! A classic, timeless beauty. Reminds me a bit of Sade’s photos in the ’80’s. on Sun Jul 15th 2012 at 23:28:06 B. R.
Billie’s voice was like a window to her soul, and, she could swing so cool over the beat. I went through a big crush phase on Billie Holiday.Read here book , listened a lot to her music..
Lester Young was one of her key soloists that she loved. Yeah, Billie was pretty badass. She had that deep, throaty voice. Diana Ross played her very well in “Lady Sings the Blues”. She captured the joy and pain that Billie most likely had. But the physical resemblance was way off. Diana was very thin, while Billie was more curvy. I also noticed that Billie’s ears were pierced. That is unusual for a time when most women (regardless of race or class) did not have pierced ears and they wore clip-on earrings instead. I heard a song called “Don’t Wait Too Long” I thought it was Billie Holiday, and it was an artist by the name of Madeline Peyroux. She sounds like Billie Holiday. I have read numerous articles about Billie Holiday, she was a very tragic figure to say the least. I like some of her music. She sounds sad, and melancholy. she was a very tragic figure to say the least. Not in that photo; there, she is badass as fu’k. The photograph is very chic and iconic love her afro woman earrings she must have been ahead of her time with those pierced ears during that time frame. Especially those afrocentric style earrings. it is a great photograph. An audio of Strange Fruit By Cassandra Wilson. I am not sure what to make of this version, because in my mind, no -one comes close to Billie Holiday. Only years later of understanding the lyrics of Strange Fruit, does it now bring about a very profound sadness whenever I listen to it. Last night, at the 17th Cape Town International Jazz Festival, I was very privileged to have sat front row directly in line ( 5 metres away from Cassandra Wilson)! She is deeply talented, blessed with incredible timbre and still remarkably beautiful for a 60 year old, especially with her wild hair like mine. She wore an ankh as a pendant and wore very little make-up if at all. The late Miles Davis was one of Cassandra Wilson’s greatest influences. Her performance was a homage Billie Holiday. ” You Go to my Head”, “Good Morning Heartache” and “Don’t Explain” brought the audience to rapture. For me, it was vicarious nostalgia and longing for Billie Holiday. I would have wanted to hear my favourites: “God bless the Child”, that takes me back to my childhood, “Summertime”( I named my daughter after Billie Holiday’s version), “Lady Sings the Blues” and of course many more. It was only an hour’ s set and way too short. I am glad Cassandra Wilson did not sing Strange Fruit, though. I saw the HBO’s Lady Day At Emerson’s Bar and Grill with the fantastic Broadway Tony Award winning actress Audra McDonald as Billie Holliday. Very insightful look into Holliday’s tragic life. I was amazed at how McDonald captured Holliday’s voice and diction that was amazing. Holliday was a tragic figure and Audra McDonald brought her to life so we could get a glimpse into who this poor woman and her demons. I saw “Lady Sings the Blues” many years ago, but if I remember it felt more like a film about Diana Ross. I had glimpsed a snippet of her life in Maya Angelou’ s autobiography, and she did not paint a pretty picture of Billie. It is always very sad that such great artists should have such tragic lives. Billie was born on this day 101years ago. Still in our hearts and minds, Billie.